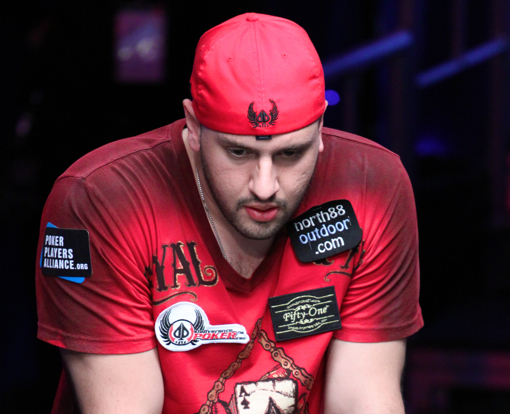 Michael "The Grinder" Mizrachi sporting the Deliverance Poker patch during the $50K final table. SPOILER ALERT: Don’t read the headline above. 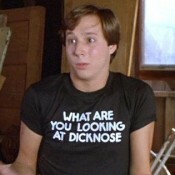 Or anything below. The 2010 WSOP on ESPN starts tonight at 9pm EST/6pm PST 8pm EST/5pm PST with Event No. 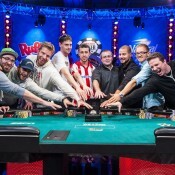 2, the $50,000 Poker Players Championship, won by Michael “The Grinder” Mizrachi. The focus will obviously be on the Brothers MizrachiTM (Rob and The Grinder) making the final table together, kick starting what eventually would become the Year of the MizrachisTM at the 2010 WSOP. The two would go on to make two more final tables each before the Main Event, where all 4 brothers impressively cashed and The Grinder November Nines it. Also kick started here was the WSOP POY race with John Juanda and Vladimir Shchemelev each going on to make 3 more final tables before the series ended. Actually, other than David Oppenheim, every player at the final table of Event No. 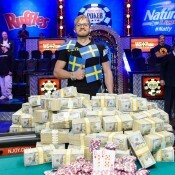 2 went on to make at least one more final table with David Bakes Baker and Daniel Alaei each grabbing WSOP bracelets. Of note, as we reported here, both Brothers Mizrachis wore their Deliverance Poker patches without the dot-net attached during the $50K final table. From the ESPN preview (view here) it doesn’t look like they blurred it out but it’s hard to see it anyway in the footage they show. What is clear is neither wore their patches during their ESPN interviews. We’ll see how it plays out tonight. :: The Brothers Mizrachis a/k/a Team Deliverance Poker here. :: Random video of The Grinder promoting Deliverance Poker here. :: The Grinder switching over to Full Tilt Poker during the Main Event here. :: A Deliverance Poker Girl we’d squeal like a pig for here. Never heard of Deliverance Poker. Went to their home page clicked their twitter account randomly a noticed all their links are dead. My first impression is of a real solid company. I like how it says on the Deliverance Poker site they strive to reduce bad beats on the river…. how would they do that and maintain the integrity and randomness of their site makes me wonder…..